Note: The Bakken counties total exceeds the North Dakota state total because the Bakken counties include crude oil production from some counties in eastern Montana. 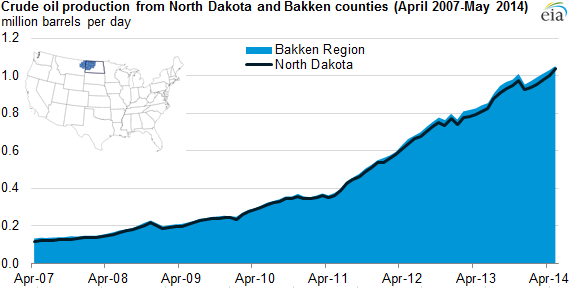 North Dakota production is for the entire state, not just counties in the Bakken Region. North Dakota crude oil production surpassed 1.0 million barrels per day (bbl/d) in April and May (the latest data available). This record is the result of increasing crude oil production from the Williston Basin's Bakken and Three Forks formations in North Dakota and eastern Montana. Although Bakken oil production initially began in the 1950s at Antelope Field in North Dakota, large-scale production growth did not begin until after the discovery of the Parshall Field in 2007. Since then, advances in drilling methods and technology, a better understanding of the geology of the Bakken, higher crude oil prices, and the formation's large size and number of wells all have contributed to higher production and to the potential for continued future growth. Defining the resource in any formation is critical in forecasting the growth and sustainability of its oil and natural gas production. Factors such as the geologic extent, depth, thickness, and porosity of a formation can inform the estimated ultimate recovery (EUR) rate of wells that are drilled in a formation. EIA uses geologic data to better understand individual well performances and the expected EUR in the Marcellus Shale, and plans to expand these efforts over time to include other formations throughout the United States, including the Bakken. EIA uses well data to create maps showing the extent and structure of the productive and prospective regions of the Bakken. 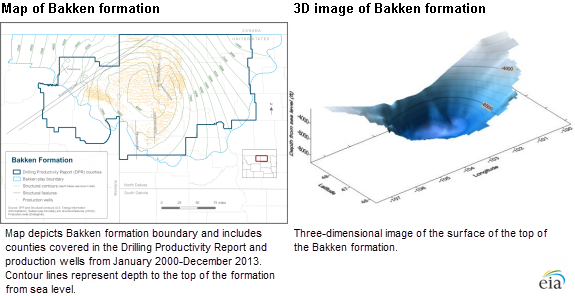 These maps help to visualize the depth and relative thickness of the Bakken formation. In addition, depth maps define the region where the resource is within optimal drilling range. Three-dimensional thickness maps can be used to determine rough estimates of resources in this region, as well as structural features such as faults and folds.